Spruce Knob State Park is located in West Virginia. At 4,861 feet above sea level, Spruce Knob is West Virginia's highest peak. It's location is in one of the darkest places east of the Mississippi. The Year Long Star Party is held during the new moon weekend of the warmer months of the year. This is a “no frills” star party which caters to those who require the very darkest skies to carry out their astronomical observation or imaging program. New or inexperienced observers are certainly welcome but there will be no scheduled program or training provided. The Northern Virginia Astronomy Club hosts star parties at this location This is a beautiful location in an untouched part of the appalacians. You can see this at Jeff Ball's web site. 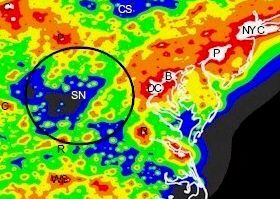 If you look at this light pollution map, you will see a dark spot on the border of Virginia and West Virginia. This is the location of Spruce Knob. Notice the light pollution in the NYC, Philladelphia, Baltimore, DC corridor. It is apparent form this image that this is truley a dark site, perhaps the drakest this side of the Mississippi. Northern Virginia Astronomical Club (NOVAC). In the past there have been reports of bears at this location so be sure to follw some simple rules to prevent an incident. There is a Yahoo Group for astronomers who frequent the site.